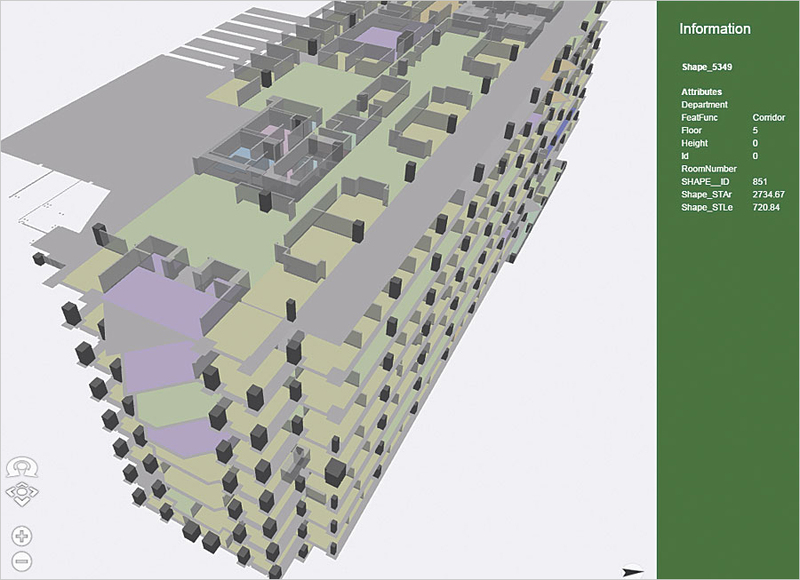 A 3D model of the interior of the Fulton County government center shows general locations in the buildings and includes two-way links to a very specific 2D floor plan map. Fulton County, Georgia, needed an easy way to locate and inventory office assets, fulfill maintenance work orders, and improve security and communication. With 295 government facilities across 22 government sections, it was preferable to do this from one system, where facility managers could gain operational awareness for strategic planning. The county decided to employ the ArcGIS platform. The IT group maintains the enterprise GIS and integrates it with county departments’ core business systems. The ArcGIS platform allows staff to analyze data, map water and sewer systems, create tax parcel maps, and perform a host of other tasks. Now, with 3D maps of buildings and 2D maps of interior spaces, Fulton County can easily access its facility information and quickly realize smart solutions. One issue that the county kept encountering was that computer-aided design (CAD) drawings of its buildings—which were saved as PDF paper printouts—failed to keep pace with changes. Many of them were decades old, and as buildings matured, the drawings were not updated to reflect modifications. It was a logical step to bring CAD data into the GIS platform, where it could be repurposed for multiple types of applications. To better visualize county buildings and simulate architectural changes, the IT group deployed Esri CityEngine. “Because CityEngine is based on procedural modeling, we designed the model with one set of instructions and continued modeling other buildings by mimicking that workflow,” explained Farrah Prewitt, a GIS analyst with the Fulton County IT group. The IT group integrated GIS with applications that help the facility management department assign and track work orders. Staff access CityEngine 3D exterior space renderings on the platform to see buildings, facility landmarks, assets, and offices. The 3D visualizations make it easier to conceptualize architectural ideas and changes. They also help managers coordinate the physical work environment with the organization’s goals. Facility and real estate managers use GIS to bring information together in various ways to show space, time, relationships, patterns, costs, key performance indicators, and more. A facilities management database can be highly detailed. It can contain an array of inventory information, such as printer installations and their maintenance history, requests to repair cracks in a wall, and notes about rotted door trim in a basement. Because of the complexity of facilities management, Fulton County wanted to add GIS capabilities to interior floor plan modeling as well. A GIS-enabled interior floor plan is essentially a basemap that can have data layers—such as office inventory, electric infrastructure, and office occupancies and vacancies—added on top of it. Staff can map the interior floor plan once and then use the same map for different purposes, including managing work orders and calculating asset replacement costs. 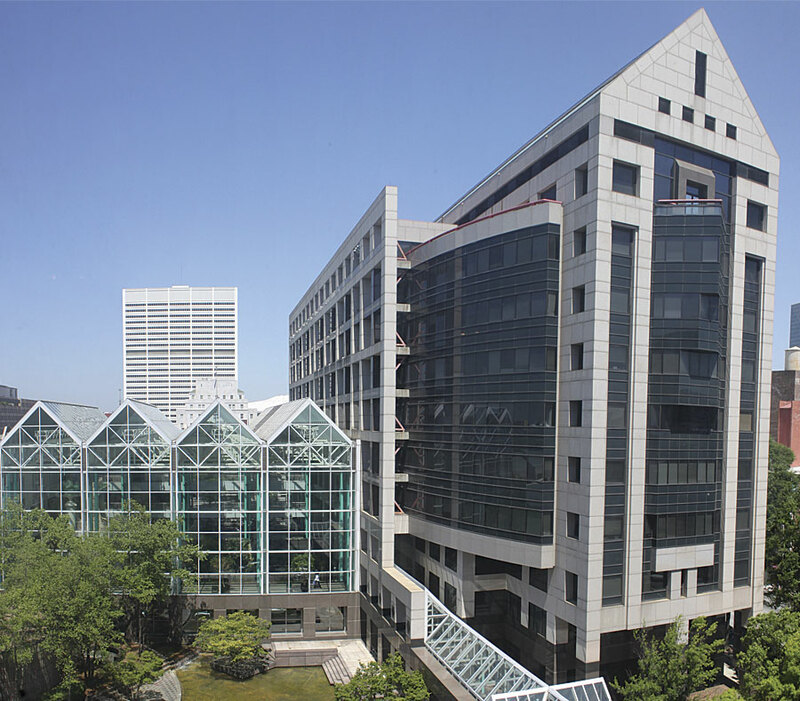 For its interior floor plans, Fulton County implemented the Esri Building Interior Space Data Model. A 3D rendering of the Fulton County center made it easy for administrators to conceptualize changes to the building's exterior and grounds. Unified Modeling Language (UML) diagrams are data organizational charts that are customized to a specific industry’s needs. The Esri Building Data Model provides the geometry needed to map specific facilities data—even from various perspectives, such as construction, facilities management, and security and emergency preparedness. Additionally, given that both the Building Interior Space Data Model and CityEngine operate on the same platform, users can easily switch between 2D and 3D interior renderings. Since implementing this solution, Fulton County has used its GIS-enabled interior floor plans to modernize its security systems and improve communication. With the ArcGIS platform implemented, Fulton County wanted to update its security system by modernizing the security camera network. The project, which is still a work in progress, aims to put new security cameras in the most advantageous locations. Using Collector for ArcGIS, county staff members are capturing the data needed for creating a virtual interior floor plan. With Collector downloaded on their smartphones, these employees use their cameras to capture images and video of every corner of a building. Collector georeferences the images and adds them to the county’s geodatabase. Prewitt uses the georeferenced images to build the interior floor plan map and posts it to ArcGIS Online. Once the camera inventory is completed, security personnel will access the floor plan model and interact with it to see the exact locations of existing security cameras. They will then analyze space and line of sight to see where new cameras are needed. Floor leaders in charge of evacuation are also using the interior floor plan to make evacuation plans that route to the safest stairwells and exits. Because the floor plan is GIS enabled and tied to a database, other variables, such as occupancy distribution, can be factored into evacuation plans. At Fulton County, the ArcGIS platform is improving communication between staff members because everyone is working from the same plan. When a new chief information officer (CIO) came on board, she didn’t know where people sat. The IT group added an employee directory layer to the interior floor plan. With that, the CIO could see the locations of the department’s five divisions and specific staff. This will be helpful if she decides to move people or relocate any divisions to meet the county’s business objectives. Other administrative staff use these interior visualizations to understand office occupancies and vacancies and make decisions, too. Fulton County integrates ArcGIS with its core business systems as well to enhance communication across divisions. For instance, the county’s building land and lease management system (BLLIS) database includes data about departments and buildings, as well as the county services they provide. After ArcGIS was integrated into BLLIS, the facilities staff could open a GIS web app and add buildings, departments, divisions, and more, to the facilities plan. Staff members could also make edits and automatically upload them to the SQL server for others to see. 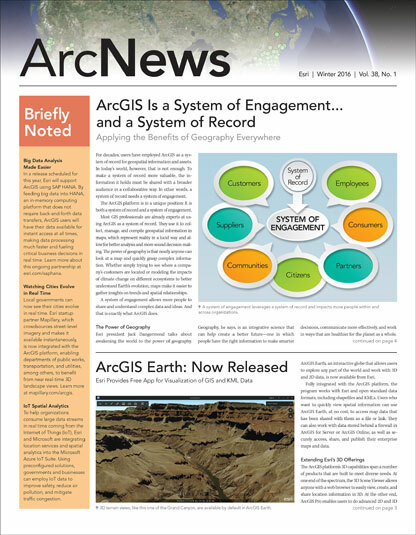 Users do not need to know anything about IT or GIS to work with these apps. Since the county began this GIS floor plan facilities project, it has completed 8 of the 12 buildings located in the county center. The IT group continues to refine its approach and will pick up speed as it deploys the GIS facilities solution across the county. Fulton County staff members are learning to use the 2D and 3D views, as well as the schematics, to help with their day-to-day tasks. County workers use web apps to search interior floor plans to locate and map facility assets, such as plotters and printers; they can even find details as precise as the assets’ model numbers. Managers use the maps to know where their assets are located, who is using them, and their level of usage so they can better control costs. As the number of ArcGIS users continues to grow across Fulton County, staff keep finding new ways to apply GIS to their daily work. For more information, contact Fulton County GIS analyst Farrah Prewitt at (404) 612-2716.